Damascus (AFP) – A US-backed Kurdish-led alliance is holding talks in Damascus for the first time on the future of the swathe of northern Syria under its control, an alliance official said on Friday. 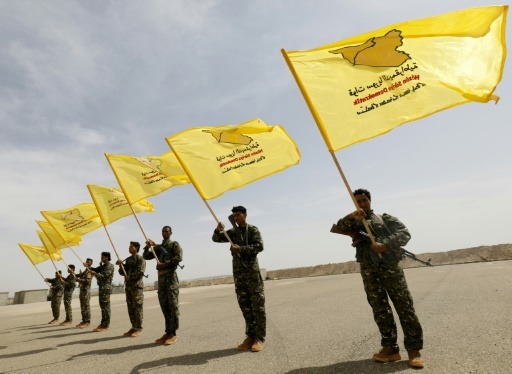 Between them the Damascus government and the Syrian Democratic Forces control some 90 percent of the country, after a series of Russian-backed victories over rebel groups in recent months saw the government reassert its authority over much of the south. The delegation from the SDF’s political wing is discussing the future of the autonomous administrations it has set up in areas of northern and northeastern Syria under its control, the alliance official said. “A delegation from the Syrian Democratic Council is paying a first official visit to Damascus at the invitation of the government,” the council’s Arab co-chair Riad Darar said. “We are working towards a settlement for northern Syria. “We hope that the discussions on the situation in the north will be positive,” Darar said, adding that they were being held “without preconditions”. AFP/File / Delil souleiman. Fighters of the Syrian Democratic Forces, trained by the US-led coalition, take part in a graduation ceremony in the suburbs of the eastern city of Deir Ezzor, on May 21, 2018. It holds not only Kurdish-majority areas along the northern border with Turkey but also the Arab-majority city of Raqa, made infamous by the Islamic State (IS) group as its former de facto Syrian capital. The SDF has since lost the Kurdish enclave of Afrin in northwestern Syria to Turkish-backed rebels, who have also threatened to seize other territory held by the alliance west of the Euphrates river. Only intervention by Washington has prevented Turkish troops from seizing the hard-won town of Manbij from the SDF, whose Kurdish units have pulled back. Ankara views the Kurdish-led alliance as a terrorist group because of its links to the Kurdistan Workers’ Party (PKK), an outlawed rebel group that has been fighting Turkish troops since 1984. Damascus too views Kurdish aspirations with suspicion and President Bashar al-Assad in late May threatened to resort to force if necessary to prevent SDF-held areas breaking away. 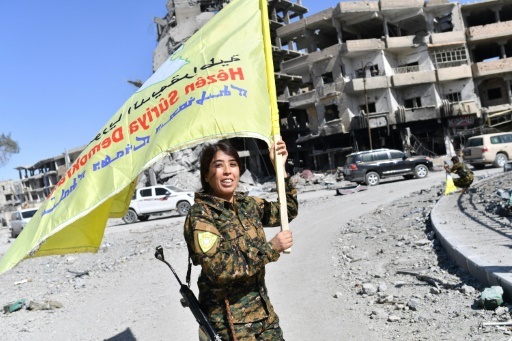 The SDF backs a federal Syria made up of autonomous cantons in the various regions, including the Kurdish-majority areas of Hasakeh and Kobane. It has already set up cantonal administrations in areas under its control which raise their own revenues and operate their own police and other services. AFP / Delil Souleiman. 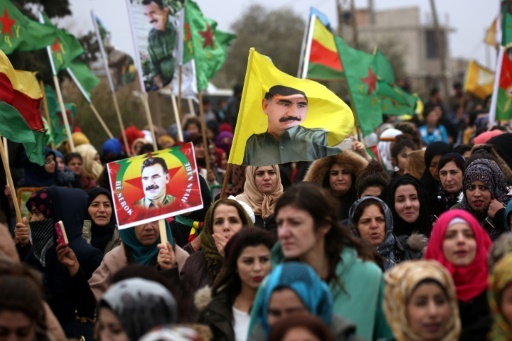 Syrian Kurds carry Kurdish flags and portrarits of jailed Kurdistan Workers Party (PKK) leader Abdullah Ocalan during a rally in the nouthern town of Jawadiyah on January 18, 2018. In a first for Syria, the SDF runs Kurdish-medium schools, although it also recognises the rights of other linguistic groups, including the Assyrian Christians. A Kurdish lawmaker who sits in the national parliament in Damascus said the talks with the SDF would focus on confining its ambitions to the cultural sphere with central government control restored in areas under its control. Damascus wanted the SDF to “facilitate the entry of the Syrian army and the return of state institutions into Kurdish-majority areas east of the Euphrates”, lawmaker Omar Usi said. Usi alleged that some in the SDF had grown wary of their US backers after Turkey seized Afrin. But the return of Syrian state control would still be a tough pill for the SDF to swallow as it continues to take losses in fighting with IS in desert areas close to the Iraqi border. The alliance has implemented much of the leftist ideology of its main Kurdish component, the People’s Protection Units (YPG), including strict equality for women in all public offices. The Kurdish flag and images of jailed PKK leader Abdullah Ocalan are ubiquitous in SDF-held areas. Featured Photo: AFP/File / BULENT KILIC. Syrian Democratic Forces commander Rojda Felat celebrates the October 2017 capture of the Islamic State group’s notorious de facto Syrian capital Raqa.